Your dedicated Business Check-in is available until 90 minutes prior to your flight. You can also check in online 24 hours before your flight and select your own seat, with the option of printing your own boarding pass. Once you’ve checked in, breeze through the airport and onboard your aircraft with our Express Path Immigration (Available in selected ports) and dedicated premium boarding lane. 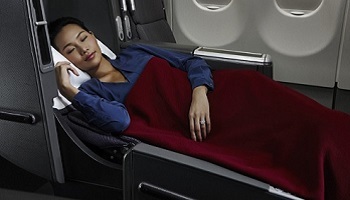 Whether you’re relaxing, working, being entertained or sleeping, fly in contemporary comfort. Enjoy a new level of intelligent seating with the award-winning Skybed. * Once you’ve made use of our extensive storage space, shift your seat into a position that suits you, using a wide range of seat adjustments. 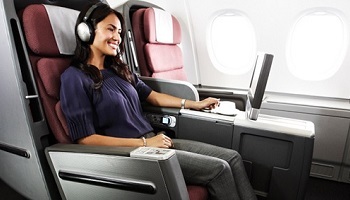 You can explore the seat’s unique massage options or settle in to enjoy your own personal inflight entertainment. You might just want to flick on your reading light and snuggle into your Skybed cocoon with a good book. When you’re ready to sleep, convert your Marc Newson-designed, second generation Skybed into a two-metre, fully-flat bed. Get sleepy in Business. The new sleep service, including a new mattress, duvet and turndown service, is now rolling out in International Business cabins across the network. Duvet service is currently on QF107 and 108 and more flights to the US to be added soon. Enjoy international flights between Australia and the US. If you’re travelling on the A380 in Business, you can catch up with your travel companions and help yourself to refreshments and magazines in a separate, furnished Business Lounge. Equipped with a 58cm LCD screen, it’s perfect for displaying a presentation or viewing a video, and also an ideal location for an unplanned meeting. Decide when you’d like to dine with a signature, made-to-order menu designed by leading Australian restaurateur, Neil Perry. Choose from a room-service style breakfast, to a multi-course dinner, perhaps dining later or eating an express meal. Whatever you choose, you’re in for a culinary experience, with a menu served on beautiful Marc Newson-designed tableware. You can also consult one of our Sommeliers in the Sky, who’ll tell you all about our selection of award-winning wines and champagnes to match your meal. 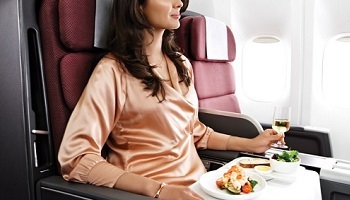 Qantas won Best Business Class Sparkling and Best Overall Cellar at the Cellars in the Sky Awards 2012. Kate Spade and Jack Spade have teamed with Qantas to develop an exclusive new amenity kit for the Qantas Business traveller (All flights subject to last minute aircraft changes.) The ladies kit features a slim line travel pouch with an exclusive City Lights print by Kate Spade. The Men’s kit features a distinctive, modern travel pouch design by Jack Spade. Each kit includes a selection of luxury Malin+Goetz skin care products, as well as comfort items, including an eyemask, ear plugs, socks and an environmentally friendly biodegradable toothbrush with Colgate toothpaste. Peter Morrissey designed pyjamas are also available on selected flights, plus luxury Malin+Goetz hand wash and cleanser feature in the Business bathroom.